【Safe and Ergonomic Design】- This kids seesaw is reinforced with a bump-absorber mechanism that allows for comfortable play by reducing impacts, making it safer than traditional park seesaws. It's the ideal playing set for outdoors and indoors! 【High Quality】- This kids seesaw is made by HDPE which is non-toxic and it is suitable for different weather condition. 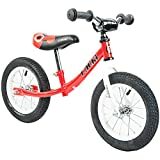 It can support up to 110 pounds or 55 pounds per child. 【Healthy Exercise】- This kids seesaws promote balance and coordination skills. Learn while they play; This motion helps to stretch and strengthen their muscles, conducive to their physical development. The ultimate addition to your backyard play set! 【Safe Seat】-Compared with the old models, this kids seesaw is optimized in the seat part, the two ends are raised high to prevent the children from falling down during the playing, we take more attention to the safety of children. 【Colorful Design】- Bright and cheerful color appeals children to play it with much entertainment. The deer-like grips and the bear-like base add more passionate when playing!!! 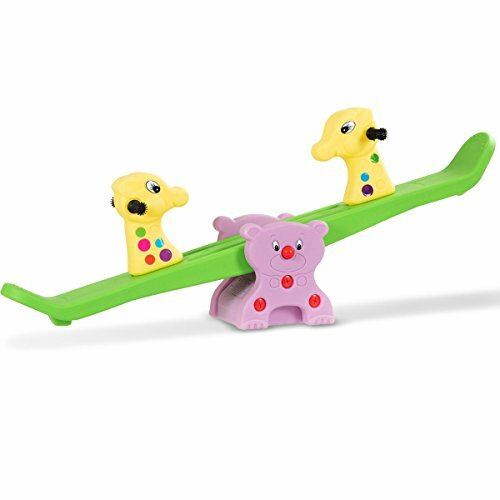 The Kids Seesaw is perfect for two children to play together. The easy grip handles and cute design make it a backyard favorite for any fun-loving kids. Stopper pole under each seat is available. Give your children a present and they can improve their coordination. It can accompany your children to grow older which has maximum weight capacity of 110 lbs.